The high-end toilet market is a lot more competitive than you may think, as companies are finding ingenious ways to incorporate new technology into a common appliance. According to the New York Times, Kohler's Numi has set the standard for American toilets, and its $6,400 price tag has many people wondering what sets it apart. The Numi features a touch screen remote control, it washes and dries its user, plays music and can heat the seat as well. The simple-to-use touch screen control takes the place of levers and buttons, and can be charged separately with a magnetic cradle when not in use. 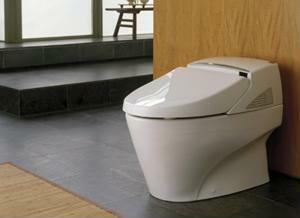 For Kohler, this toilet is a way to appeal to the high-end toilet market, as well as educate middle-of-the-road consumers about the potential of their products. Since there isn't much news in the world of bathroom accessories, this cutting-edge technology could be a high point for the company's business plan. While many Americans aren't going to run out and drop nearly $7,000 on a new toilet, it does illuminate some of the technology that could be standard in future devices. Is there any feature that would force you to pay this much for a toilet?